Glutino products and giveaway Glutino coupons were gifted to me for this post. All opinions are my own. Celebrations call for cakes, right? To celebrate my third Glutino Giveaway, I created 3 Gluten-Free and Divinely Decadent Cakes. The recipes are simple and the results are splendid. While friends admire your cakes, you may even find yourself saying, “It was nothing.” You will be telling the truth! For a minimum of effort, you’ll get maximum dessert excellence. Banana cake resplendent with chocolate chips and salted caramel pretzels...all gluten-free! 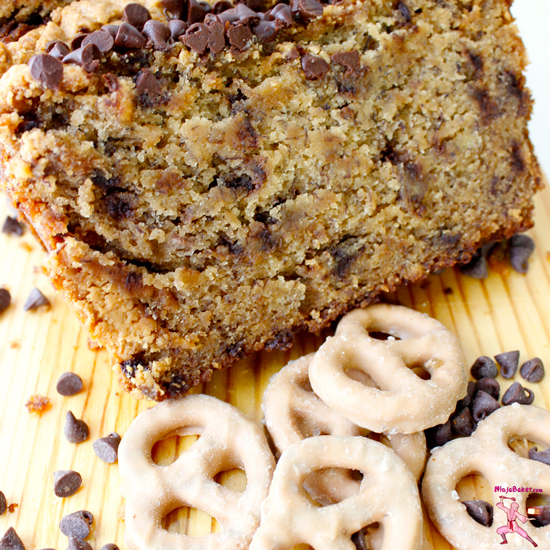 ABCs to the health benefits of Gluten-Free Caramel Pretzel Crumble Chocolate Almond Butter Banana Cake. A: Almond butter helps regulate blood sugar and superlative heart health. B: Bananas are high in B6 and a natural anti-depressant. C: Chocolate helps alleviate stress and strokes…C is also for caramel pretzels which are used as a crumble atop the cake. Surprisingly, the Salted Caramel Pretzels produced by Glutino are relatively low in sugar. in a luxurious case of gluten-free chocolate cake. Gluten-Free Lavender Chocolate and Japanese Green Tea Matcha Layer Cake requires a wee bit more time and assembly. Still, I highly recommend giving the dessert a try! Even my Japanese friends (known to be a bit on the critical side of my sweets), gave stamps of approval. They applauded the wabi-sabi (subtle balance) of sweet and feather-light sponge of the gluten-free matcha and lavender cake. Japanese green tea matcha is the beverage of the samurai. While energizing the body, Japanese matcha also keeps the mind alert and awake to inspirations garnered during meditation. The potent powers of lavender go as far back as ancient Egypt. Doctors today confirm lavender's ability to combat depression and stress. 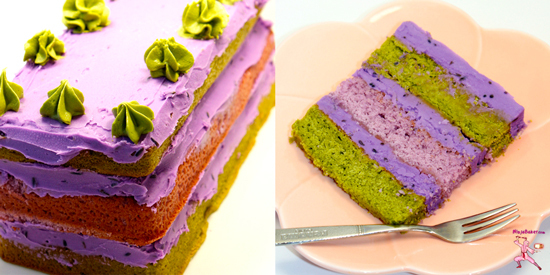 Do you really need any more reasons to kick off your shoes and dive into a novel and…a slice of Gluten-Free Lavender Chocolate and Japanese Green Tea Matcha Layer Cake? Or any other of the gluten-free and divinely decadent cakes? Salted caramel pretzels presents the perfect foil for the beautiful balance of moist cake punctuated by banana, almonds and chocolate. Peanut butter is interchangeable with almond butter in this recipe. Almond butter may be a healthier choice. Whichever way you bake up this loaf cake, I do believe your lips will discover one luscious bite of deliciousness! Inspired by Iron Chef Michael Symon's recipe as featured on ABC TV's The Chew. Spray a 9” x 5” loaf pan with baking spray. Set aside. Crumble pretzels in a food processor. Add 3½ tablespoons melted almond butter to the gluten-free salted caramel pretzels. Constantly stir while melting the 6 tablespoons of butter over low heat in a saucepan for about 5 minutes. Take the pan off the stove when a nutty aroma emerges and the butter is golden brown. Whisk in the instant coffee powder. Allow the coffee butter to cool while sifting the flour, baking soda, baking powder, salt and cinnamon in a bowl. In another bowl, whisk together the melted butter with coffee, sugars, egg, egg whites and almond extract. Scraping the bowl often, stir in the flour mixture. Sprinkle in a ½ cup of mini chocolate chips. When well combined, pour the batter into the prepared loaf pan. Top with the crumbled caramel pretzel and melted almond butter combination. Garnish with the remaining ½ cup of mini chocolate chips. Bake covered with tin foil for 45 minutes. Remove the foil and bake for another 30 to 45 minutes or until a toothpick inserted in the center comes out clean. Matcha and lavender are famous for elevating moods and fighting stress...Cake has a reputation for bringing on a severe case of smiles. Why not take time to enjoy this gluten-free feather light cake? Pans designed specifically for creating the layer look helped. 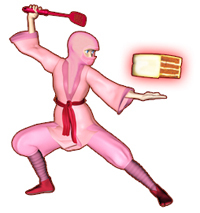 The special pans, however, are not necessary. I ended up making two batters and having extra for cupcakes. This recipe was inspired by the white birthday cake featured on That Skinny Chick Can Bake. Divide the cups of milk between two separate saucepans. Put 3 tablespoons of matcha in one and 3 tablespoons of lavender into the other pan. Allow tiny bubbles to emerge. Cool to room temperature. Strain the lavender from the lavender milk mixture. Preheat the oven to 350 degrees. Prepare pans with baking spray and muffin tins with cupcake cases. Measure out 4½ cups Glutino Gluten-Free Pantry All-Purpose Flour. Then take out 8½ tablespoons out of the flour. In the bowl of a kitchen stand mixer, slowly whisk the flour together with the corn starch. Add the sugar, baking powder and salt. Beat in the butter at a slow speed. Divide the mixture in half and separate into two bowls. Alternate combining the flour mixtures with the milks. Pour the batters into the prepared pans. No more than ½ to ¾ full. Use he extra batter for cupcakes. Bake time for an 8” layer is about 30 minutes. Cupcakes require approximately 26 minutes. (Insert a toothpick into the cake centers to make sure no major crumbs are attached. Bake until the toothpick comes out clean.) Cool. Heat the heavy cream with 3 tablespoons of lavender and drops of lavender food coloring just until bubbles appear. Strain the heavy cream. Pour over the white chocolate chips. Stir vigorously until smooth. Let the lavender chocolate stand untouched for 30 minutes or more. (Up to 3 hours is fine. Although the mixture will harden the longer it stands.) With a hand-held mixer, whip up the lavender white chocolate mixture. Smooth in between the layers of matcha and lavender cake. Or slather atop lavender cupcakes. Add 3 tablespoons of matcha green tea powder to cups of your favorite vanilla frosting. Pour in the powdered sugar if you need stiffer frosting for piping stars onto the cake and cupcakes. Gluten-free chocolate polka dots peek out from luscious gluten-free chocolate cake....Sooo easy to make. P.s. It take a bit more effort to convince your friends and family this is not "real" chocolate cake. Whisk together the eggs, butter and vanilla bean paste. Stir in the Glutino Gluten-Free Pantry Muffin Mix and coconut milk creamer. Bake per manufacturers instruction in a cake pop machine or cake pop pans. Cool. Freeze overnight in a parchment or wax paper lined container. 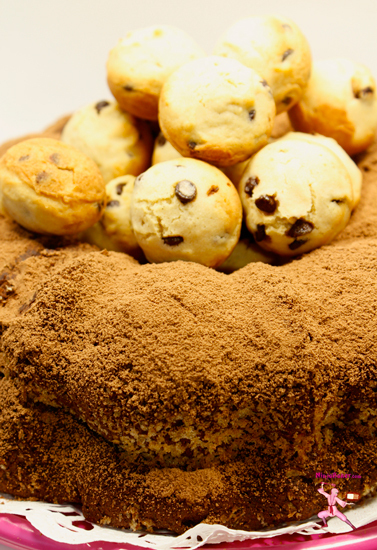 Coat a bundt pan with baking spray. Beat together the Glutino Gluten-Free Pantry Decadent Chocolate Cake Mix, Greek yogurt and vanilla. Pour half of the batter into the prepared bundt pan. Side-by-side place the frozen chocolate chip polka dots around the pan. Cover with the remaining batter. Wishing you well-deserved desserts for all you do every day.